When Milwaukee Electronics' Design Engineering Group is confronted with a problem that even our customer's engineering team is having difficulty solving, we take it seriously. When that is issue involves product safety, designing the right solution is even more important. In this example, we used our breadth of electronics design, software design and mechanical design expertise to create a smarter control that not only made a potentially dangerous tool safer but also gave our customer increased capabilities on a related product. The process required evaluating technologies early on and a clever algorithm embedded in a microcontroller. The results are two products that continue to be manufactured. In 2006, a customer approached Milwaukee Electronics with a potential safety hazard issue due to the misuse of their equipment by operators. 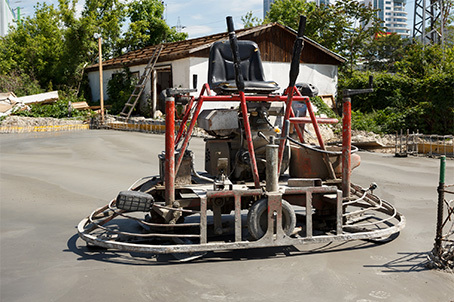 The walk behind concrete finishing trowel that they manufacture is a large spinning trowel blade driven by a gas engine. 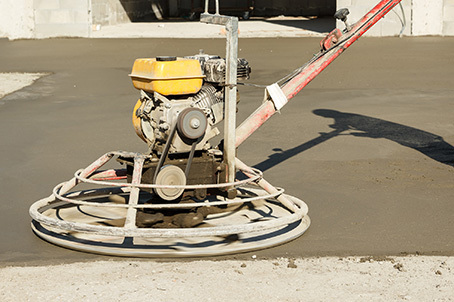 The operator holds the handle and swings this tool back and forth across newly poured concrete to achieve a finished top surface. The operator must activate a pair of safety sensors mounted on the handle with his hands to engage the machine. If the operator accidentally lets go of the handle, the motor braking system must engage prior to completing a single rotation of the now stationary machine to prevent injury to the operator as the handle swings around. This customer had received complaints that operators would activate the sensors with other means to eliminate the need to use both hands. This created a safety hazard. Prior to contacting Milwaukee Electronics, the customer's engineering team had been working on an electromechanical solution for over (18) months, but failed to develop a solution due to variations in the mechanical portion of their design. Milwaukee Electronics provided the customer with a preliminary development quote to research and evaluate multiple potential design concepts. This quote also included selection of an off-the-shelf plastic enclosure to reduce tooling investment costs. At time of project launch, our engineering team visited the customer to observe a demonstration of the effects of this potential safety hazard. Our team then analyzed the electromechanical design version for any potential takeaways that could be applied to the new design. The next step was a brainstorming session that included both engineering departments as well as the customer's product management team personnel. The outcome of this discussion included the research of a potential accelerometer solution and a gyroscope solution. A sample of each was obtained and both devices were bench tested for comparison results. Based on the requirement to halt a spinning trowel handle within 270° of travel, the gyroscope device was selected due to the response time. Milwaukee Electronics' design team utilized our electronics design, software design and mechanical design expertise to create an industrial control that included a single plane gyroscope with a small microcontroller that is mounted onto the walk behind trowel's horizontal frame. This control monitors the horizontal rotation of the machine while ignoring the back and forth swinging action during normal operation. If the handle is suddenly released by the operator, the control monitors the acceleration in rotation and then snubs the engine spark causing the RPM sensitive braking system to activate within a single revolution of the entire machine. During initial prototype testing of the control, the unit was unable to meet the stopping requirement due to the gyroscope response time. Milwaukee Electronics resolved this issue by implementing a pre-emptive snubbing software algorithm. The microcontroller monitors the gyroscope movement data and begins to snub every other engine spark should acceleration start to increase. This does not cause any issues with engine run performance but does allow the industrial control to “look ahead” in preparation for the need to fully snub the spark. Due to the severe environmental conditions and the difficulties with mounting an off-the-shelf enclosure, the circuit board assembly is now assembled into a custom potting cup enclosure that was designed by Milwaukee Electronics and then sealed with an epoxy resin for protection from the physical elements and the extreme temperature conditions that are generated by the gas engine.